Get used to being part of the big time, Zags fans. There is a commonly known division of ancient history into three broad time periods: the Stone, Bronze and Iron ages. Each new age radically different than the one which preceded it, and clearly separated from the previous age by society's mastery of a new material. Overly simplistic, sure, but helpful enough. Such categorization is not possible when trying to arrange the chronology of college basketball. The Zags have been ranked No. 1 in the polls before. It happened in 2013 and again in 2017. They've played great teams before, and they've defeated too many of them to count. They've even played both North Carolina and Duke in the same season — Gonzaga defeated the No. 2-ranked Tar Heels but fell to the No.-6 Blue Devils — way back in 2006. Now, in 2018, Gonzaga's schedule once again includes those two college basketball powerhouses. But this year's Zags don't look anything like that squad from over a decade ago that faced this same task. It's as if Mark Few's current team is armed with steel, an obvious upgrade from the iron — or bronze, or stone, if you prefer — of 2006. At some indiscriminate point in recent history, the Zags broke free from the shackles of the past. They're very much the team of the moment, as modern as it gets. Duke versus Gonzaga in the Maui Invitational championship game was the matchup that needed to happen. It lived up to expectations and the Zags prevailed 89-87. After the game, Duke coach Mike Krzyzewski — a man who has led the Blue Devils to five national championships and the United States men's national team to three Olympic gold medals — heaped praise on Few and the Zags. "He's done a marvelous job with his program," Krzyzewski said. "And it's an honor to play against him and their fan base and it's great game for college basketball today." Michael Jordan's alma mater, North Carolina, invited the Zags over for a date this Saturday, Dec. 15. And the Tar Heels say they'd like to make a trip to Spokane, too. They'll check out the Kennel sometime next year. Travelling across the country to play a really good team on the road in December isn't anything new for the Zags. Thinking about a time when those road trips didn't come with a guarantee of a return game in Spokane the next season, though? That feels like ancient history. Was it in 2017 that Gonzaga emerged into this modern era? Did making the National Championship game bring this about? Well, it certainly helped lock down Saturday's game in Chapel Hill. Gonzaga did, after all, lose to North Carolina in the 2017 National Championship game, and shortly thereafter, this series was scheduled. 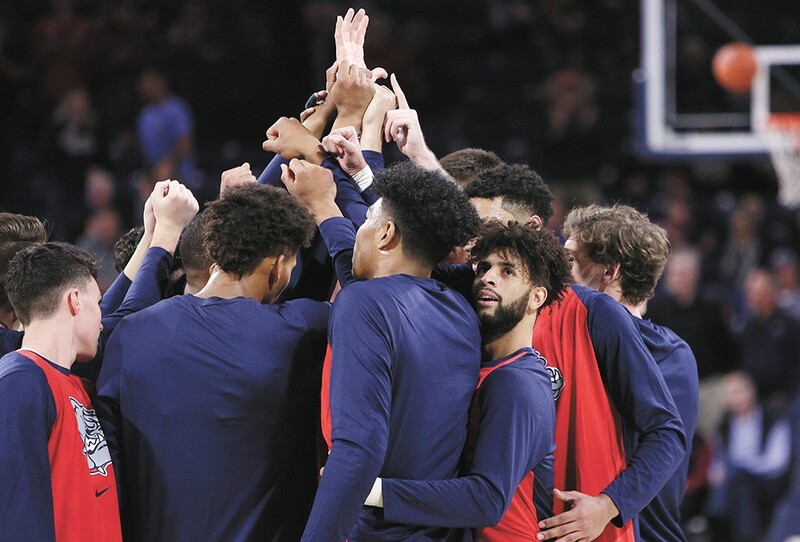 When the title game tipped off on that Monday evening in early April, Gonzaga was still seen as a plucky underdog, even though both Gonzaga and North Carolina had played their way through the bracket as the top-seeded team in their respective regions. This year, in the Tar Heels' house, a Gonzaga win wouldn't be seen as an upset. The Zags will be the higher-ranked team. They'll be the ones with the most talent and the most experience. Just like the Duke game last month, the North Carolina game will be a matchup of two of the best programs and best teams college basketball has to offer. Even though the Blue Devils and Tar Heels have together won 11 national championships, to Gonzaga's zero, the Zags belong here, which is clearly a departure from the past. No. 4 Gonzaga vs. No. 12 North Carolina tips off at 4 pm Saturday, Dec. 15 on ESPN2. The original print version of this article was headlined "Dawning of the Gonzaga Age?"